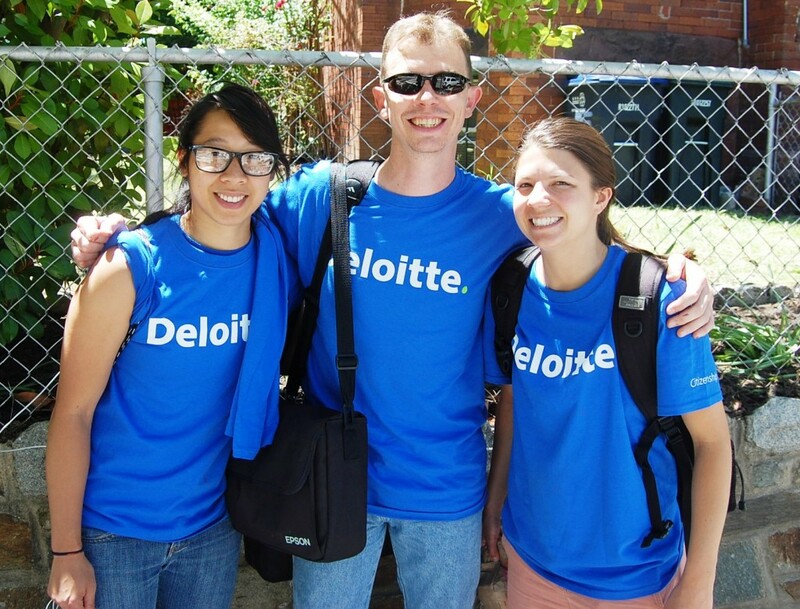 June 7th was the day set by Deloitte to partake in their yearly IMPACT DAY 2014, and Samaritan Inns was more than happy to be participating again. Typically Deloitte comes to Samaritan Inns to provide a day of financial and career mentorship for our residents, which in turns gives them the tools to face the world ahead. 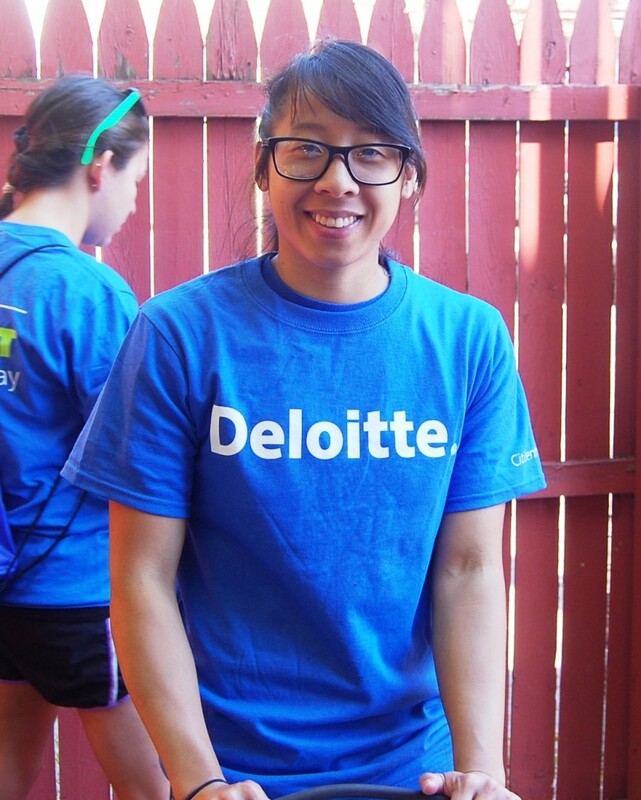 This year Deloitte came to us to embark on a different kind of service project. 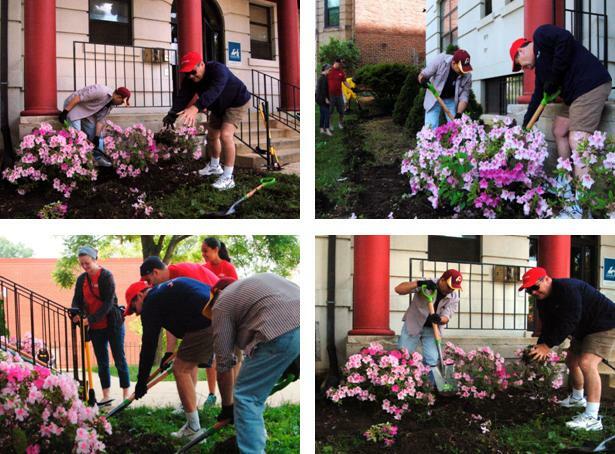 This year they came to tackle a beautification project at our Mozart Inn locations. A group of energetic and enthusiastic workers dressed in blue came to Elisha’s Houseready to tackle this day of service! After an impactful morning program they walked over to begin work at the Inns. The day was filled with landscaping, painting and camaraderie among the staff here at Samaritan inns and Deloitte. It was truly and a great day of service and was well received by the residents who occupied that property. On behalf of the staff and residents of Samaritan Inns, we would like to extend our deepest gratitude to Deloitte and cannot wait for next year’s IMPACT DAY! 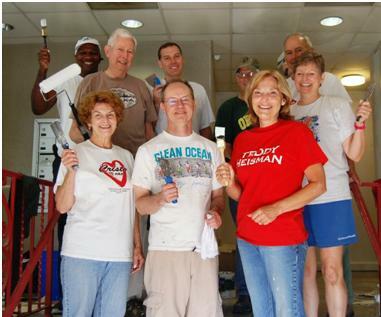 It has been a very productive summer so far here at Samaritan Inns and the volunteer projects just keep rolling in! On June 23rdwe were blessed to have First Christian Church Disciples of Christ come and volunteer their time and energy to our organization. The congregation came all the way from Kentucky to perform a beautification project for our Tabitha’s house location where they gave the buildings hallways a new up-to-date look! The Church has missions group has traveled all over to provide service and help those who are less fortunate and consider it their mission to lend a hand wherever they can. The team arrived and went straight to work and not only did they do a beautification project but they took time out on Monday to participate in our Dinner Fellowship program! The Intensive Recovery staff welcomed them with open arms and they say and fellowshipped with our clients and provided much needed words of encouragement. It was truly an impactful time of service and we here at Samaritan Inns are truly appreciative of their time and effort! The spring is a time for revitalization and new beginnings and that is what the Attain Group brought to Samaritan Inns. On May 17th the team from Attain came and did a beautification project at our Lazarus House property where they came and planted many eye catching flowers. After they completed their project the group went and hosted a barbeque for the residents in our Intensive Recovery Program! On behalf of the staff and residents we would like to thank them for all of their hard work and service. At Samaritan Inns, our maintenance staff puts in a lot of hard work to make sure that our residents are provided with a clean and safe facility. 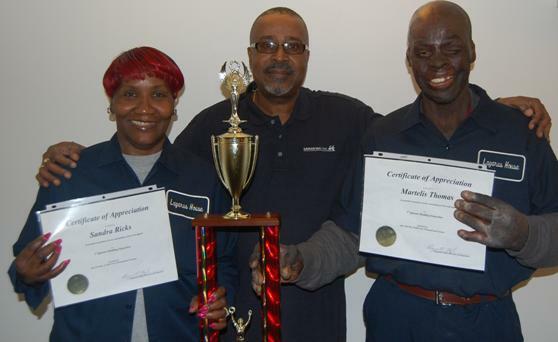 Each year Reginald High, Director of Properties, holds a contest for the “cleanest” facility to give our staff recognition for all of their dedication. The staff compete every year to win a trophy that will be displayed for all to see in their building. This year the staff at our Lazarus House location were the winners of this coveted prize! We would like to take this time to acknowledge and congratulate them on their dedication to our facilities and program as a whole!